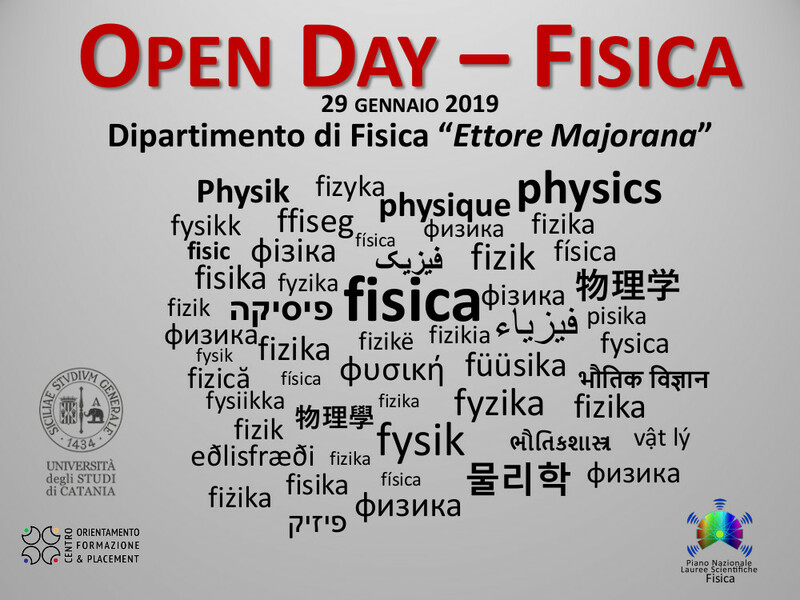 Open Day 2019 | Department of Physics and Astronomy "E. Majorana"
This year 2019 the #DFA will again open its doors to visitors. Students from high schools will have the opportunity to visit the places of the Department and of the research Institutions connected thereto, talk to professors, get information on course plans, attend lessons and visit laboratories, get acquainted with the Scuola Superiore di Catania. Students will then be able to be informed on the degree courses offered by the #DFA and hopefully get enrolled in our undergraduate Programme in Physics. In order to participate to the University's Open Days, high schools should register online and subscribe their own students. For more information on the event at #DFA, please contact Professor Josette Immè or Mrs Grazia Platania (pls-fisica-ct@ct.infn.it) of the Piano Nazionale Lauree Scientifiche.